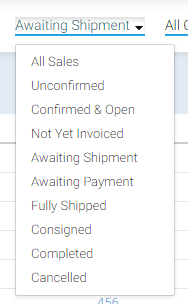 Stitchex Sales Order Current State Status reports show you which Sales Orders are unconfirmed, confirmed and open, not yet invoiced, awaiting shipment, awaiting payment, fully shipped, consigned, completed and cancelled. These reports are available by Season, Channel or Agent. And, they can be broken down even further. Select Sales Order from the main left vertical menu. 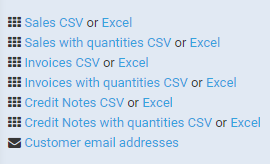 Note: From the Figure 1 view, you can also click on the column header for Customer, Season, Order (#), Order Date, or Start Ship Date to sort in ascending or descending order (toggles). For additional Reporting options on Sales Orders, please see our Sales Order Reporting Knowledge Article.